A model of the new F Series wheel loader. Case, a leading brand of CNH Global – the holding company for the Italian manufacturer of agricultural and construction equipment – will present an industry-leading offering for urban construction, road building, aggregates and recycling applications complemented by Iveco’s vehicles for the construction industry. At the heart of Case’s 4,150-sq-m stand at the Paris-Nord Villepinte Exhibition Centre will be an area dedicated to technologies and services developed to help customers run their construction businesses more effectively. Intermat, a world-class showcase for major players in the construction materials production industry, will be the launching pad for the new F-series wheel loaders and for Case’s first grader. Some of the key products on display will be Case’s SiteWatch telematics system, which can help fleet managers optimise the deployment and performance of their equipment effortlessly. Also promoted will be the Leica Geosystems machine control solutions, featured on many Case models following the strategic partnership with the Swiss company, which ease operation and ensure precision. Case will introduce its new-generation D Series crawler excavators with four new models ranging from 25 to 40 tonnes, which will feature Tier 4 Final (Stage IV) maintenance-free technology and raise the bar on performance, controllability, fuel efficiency, comfort and reliability. These machines offer the high productivity, comfort and safety combined with low running costs that construction businesses look for, said Case. The new F Series wheel loaders will also make their first public appearance at Intermat. They feature heavy-duty axles and four solutions unique to Case – the Hi-eSCR in-house technology that meets Tier 4 Final and EU Stage IV standards without the need for particulate filter or EGR valve, as it kills the sparks in the exhaust; the rear-mounted engine that increases bucket payload and ensures easy maintenance from ground level on models up to 20 tonnes; Proshift five-speed transmission and torque converter lock-up that cuts down cycle times and fuel requirements on models up to 20 tonnes; and the Case heavy-duty cooling cube whose unique design is exceptionally effective in dusty conditions. Also on display will be the first Case grader range, the C Series. This powerful grader features the patented Hi-eSCR technology developed by FPT Industrial to meet Tier 4 Final standards, delivering high performance with exceptionally low fuel and maintenance costs. The new machine bristles with features, Case said, contributing to its superior controllability, performance and traction. Intermat will showcase Case’s F Series compact wheel loaders launched in September last year, which set new standards of productivity, versatility, comfort, all with low cost of operation. The four model line-up, ranging from 4.4 tonnes to 6.2 tonnes, delivers consistently high levels of performance in every task with the powerful, highly efficient new hydraulic system, according to Case. With the low cab, the new compact wheel loaders move efficiently in every jobsite and are easy to transport, it added. 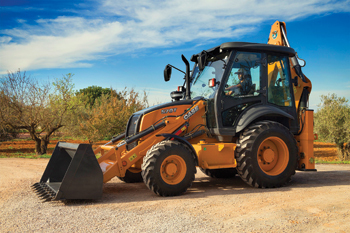 Case will introduce five new models that will extend and upgrade its skid-steer and compact track loader line-up. The new models, some of which will be on display in the Urban Construction area, include Case’s maintenance-free Tier 4 Final technology, which deliver more power, higher torque and breakout force while using less fuel. 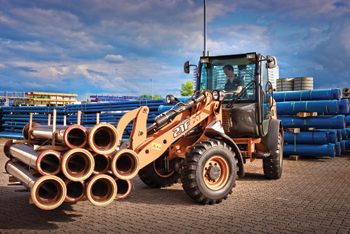 The new 570T backhoe loader at the Case Customer Centre is an entry-level backhoe loader specifically designed for the African and Middle Eastern markets. It features a highly fuel-efficient engine, strong S-styled boom, heavy-duty front axle and the largest cab in its segment. Case Construction Equipment sells and supports a full line of construction equipment around the world.